Just about the time you decide, after watching too much of brat-activist David Hogg on TV, that America’s future leaders are all anti-constitutional Leftists along come a couple of events that should reassure you that all is not lost. The first is the announcement of the Tennessee Star’s Spring 2018 Constitution Bee, sponsored by the Polk Foundation, held at the Williamson County [Tennessee] Administrative Complex a week ago. Seventeen students from across the state of Tennessee, representing Mount Juliet High School, Lincoln County High School, Stewarts Creek High School, John Overton High School, Central Magnet High School of Murfreesboro, Ravenwood High School, and the home school group of Middle Tennessee, participated in the Constitution Bee. During the competition, students sat in the same chairs used by Williamson County Commissioners and stepped up in front of the judges and audience when their turn to answer a question came up. A warmup round, known as the Preamble Challenge where students deliver the Preamble to the Constitution in whatever method they choose–oration, dramatic reading, song, dance, or rap. At the end of the event, the judges awarded three prizes for this round for “The Most Creative Preamble,” “The Most Entertaining Preamble,” and “The Most Persuasive Preamble.” Students who received these awards earned one point for their high school in the team championship competition. You can read about the three students who received awards in this warm up round here. After the warmup round, the contestants were asked multiple choice and true/false questions in Rounds 1 and 2. All 17 students answered the Round 1 questions correctly, only one student missed a Round 2 question. Cooper Moran, a junior at Lincoln County High School, won the individual championship. 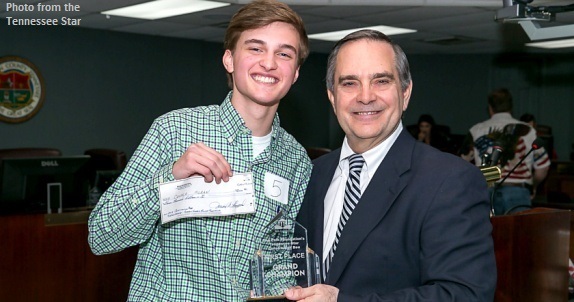 Moran was presented a check for $3,000 as the first winner of the Andrew Woodfin Miller Foundation Scholarship, which was provided through a donation to the Polk Foundation, and presented by Constitution Bee master of ceremonies Michael Patrick Leahy, CEO and Editor-in-chief of The Tennessee Star. In addition to the scholarship, Moran will receive a free trip for two to Washington, D.C. to attend a series of events of his choosing. Moran told The Star that his mother, who was among those in the audience on Saturday, will be accompanying him to the nation’s capitol for that trip. Moran hopes to attend Vanderbilt University and plans on majoring in political science. He intends to become a lawyer. Three students, including Moran, survived seven rounds of competition involving increasingly difficult questions and an Essay round to compete in the dramatic championship round. The other two students in the championship round were Amanda Nolan of Mt. Juliet High School and Aryan Burns, also of Lincoln County High School. You can read more about the Tennessee Star’s Constitution Bee through this link. Perhaps your state or school district is ripe for starting a Constitution Bee on the Tennessee Star model. The other event that should give conservatives hope for our next generation of leaders is the National Bible Bee, now in its ninth year. The National Bible Bee is sponsored by the Shelby Kennedy Foundation. Shelby Kennedy, who died of cancer at the age of 23, spent her life studying the Bible and proclaiming Christ. After her death, The Shelby Kennedy Foundation, was established as a non-profit in her name to encouraging children and youth to memorize Scripture. The National Bible Bee Competition Show, premiered April 24th on Facebook Live. New episodes will broadcast on Tuesdays at 8:00 p.m. eastern. Forty-five young people ranging from 7 to 18 years of age are competing for $100,000 in prize money in the six fast-paced weekly episodes. The contestants for the National Bible Bee Competition Show are chosen from the annual National Bible Bee Summer Study in 3 age divisions: Primary (ages 7-10), Junior (ages 11-14) and Senior (ages 15-18). The top 120 contestants in each division compete nationally in Scripture knowledge and memorization. In preparation, young people commit to memory up to 950 Bible verses. The National Bible Bee Competition Show is co-hosted by Emeal Zwayne, president of Living Waters Publications, identical twins Jason and David Benham, former professional baseball players, bestselling authors and serial entrepreneurs, and Hannah Leary, winner at the first National Bible Bee Game Show. "There is something special that happens when young people commit the Bible to memory," says Steve Green, Chairman of Museum of the Bible and sponsor of the show. "These kids are having fun and we are excited to be a part of its ground-breaking run on Facebook Live." Since the show began, the National Bible Bee organization saw a 25% increase in participation in the 2017 Summer Study where young people learn how to not only memorize Scripture but also learn the tools to study the Bible for themselves. Since the National Bible Bee's first contest in 2009, more than 40,000 young people have participated. Thousands of young people who are learning how to unlock the Scriptures and memorize God’s Word! The 8-week Summer Study prepares and encourages participants to memorize and study Scripture, whether they are studying on their own or taking part within a church or other hosted group. Registration for the National Bible Bee Summer Study closes on May 31, so register your child today in this wonderful opportunity to study the Bible and learn its undying truths. Submitted by Ckm4cuqB2q on Sun, 05/06/2018 - 05:09.